If looking for five star, Fallsview, luxury Niagara Falls hotels, you are on the right page and on the right, Canadian side of the border. Use this review to find only the best hotels in Niagara Falls Canada that are relatively new or redesigned and rated with four and five stars. These quality hotels are advantageously located near Niagara Falls, giving you a perfect fallsview experience. This is why Hilton, Marriott, Embassy are usually called Fallsview hotels. Downtown hotels, like Sheraton, Brock Plaza are mainly for visitors looking for night life entertainment and night bars in Clifton Hill district, with an easy access to the Rainbow Bridge and US. 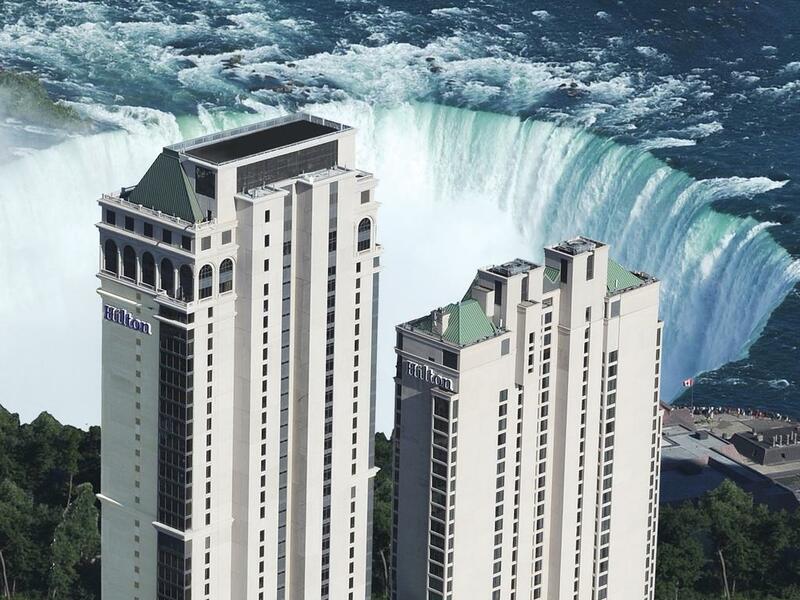 Fallsview hotels in Niagara Falls are also family hotels, dog friendly hotels and romantic hotels with high class Fallsview restaurants, pools, close to water parks; offering you numerous shows, entertainment, theatres, rich night life, sightseeing tours, vacation packages, honeymoons, weddings and more. To find the special hotel rates, hotel deals, discounts, easy room reservation and hotel maps, we have provided a few travel links for your hotel booking convenience. Hilton Fallsview hotel is the best known of all Niagara Falls hotels. Since it is becoming the Canada’s tallest hotel tower, it is perfect for a panoramic view and romantic getaway. And for your entertainment and night life, Fallsview Casino is right across the street. Read a full Hilton review. Embassy Suites Fallsview hotel is one of the closest hotels to the Falls where the hotel’s rooms are offering a breathtaking view. This luxury hotel is surrounded with the finest Niagara attractions and Fallsview restaurants; the KEG steakhouse is must to try. At Embassy Suites Niagara, you can find some lovely, romantic packages, or if coming with kids, super family fun packages. Read further for the full Embassy hotel review. 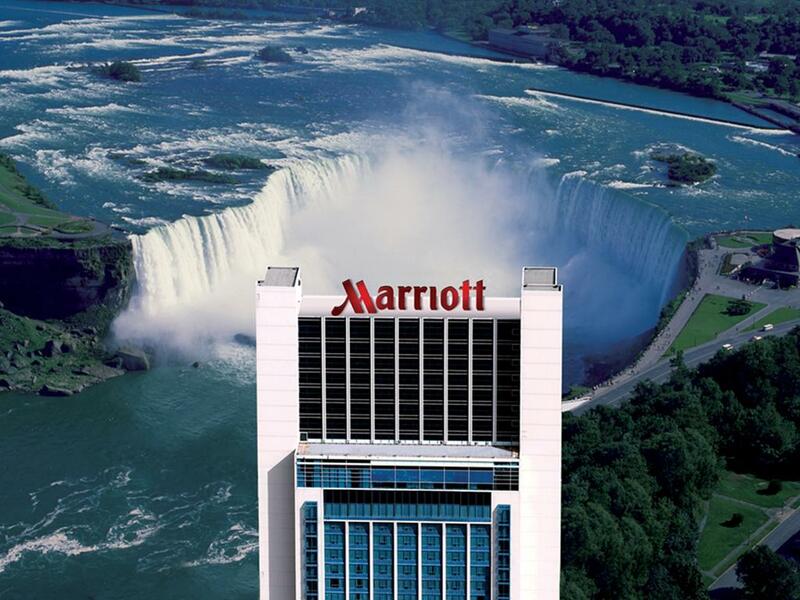 Fallsview Marriott hotel is another one of the best hotels in Niagara Falls region that we recommend. It offers the most luxurious place to stay; Presidential Suites. Just imagine spending a night there, with your sweetheart. Perfect curving design, provides to almost every room at Marriott Fallsview and Spa an unobstructed, impressive view of Niagara waterfalls. More about Marriott hotel review. The Oakes hotel is the great place to enjoy all the lavishness and abundance of amenities for the affordable price. The Oakes is my favorite place among all Niagara Falls hotels. It is right above the Horseshoe waterfall, between KEG restaurant / Minolta Tower, and Fallsview casino / Skylon Tower. The Oakes hotel features the Fallsview observation level on the top floor, and you as a guest will receive complimentary access … more on the Oakes review page. 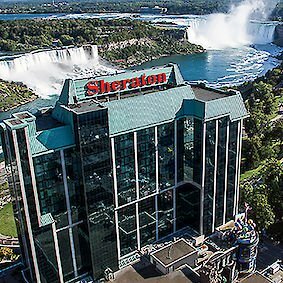 Sheraton Fallsview hotel, one of the finest downtown hotels in Niagara Falls, is overlooking the American Falls, and is located steps away from the old casino and Fallsview indoor water park. There are only few hotels in Niagara Falls with a restaurant as Penthouse Fallsview, and Sheraton is one. Take your soul mate to a candlelight dinner and enjoy a stunning sight of Niagara Falls. You will be overwhelmed with a pleasant sensation. This is one of the greatest restaurants amid Niagara Falls hotels… see Sheraton hotel review. Consider following. Staying in Niagara Falls means a lot of activities, things to do, great offer for nightlife, variety of restaurants, accommodation that range from cheap motels, huge chain hotels near Niagara Falls, to quaint bed and breakfast and Inns. And it is over-crowded in the summer. 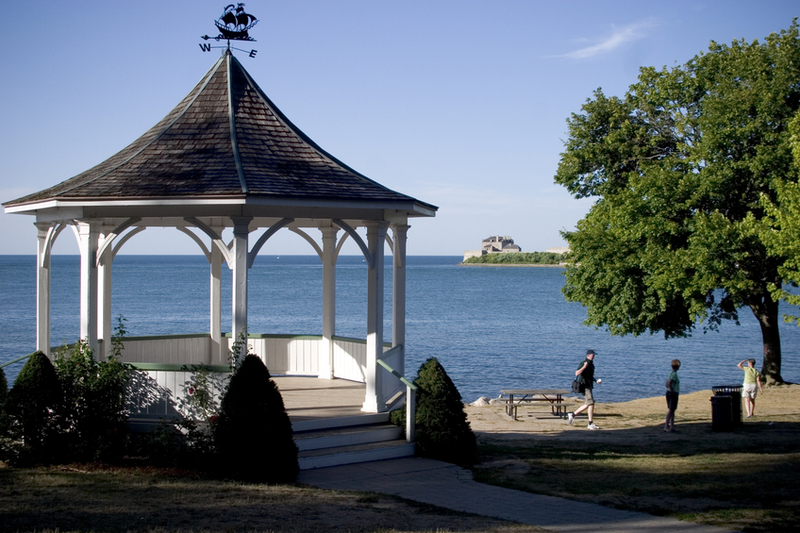 The great alternative to these superb Niagra Falls hotels, if are on a budget or if you cannot find yourself here, is the accommodation in much quieter place of Niagara on the Lake town and serenity of the wine region. Honeymoon in Niagara Falls Looking for Niagara Falls deals? Find Budget and Discount Tips to Save! 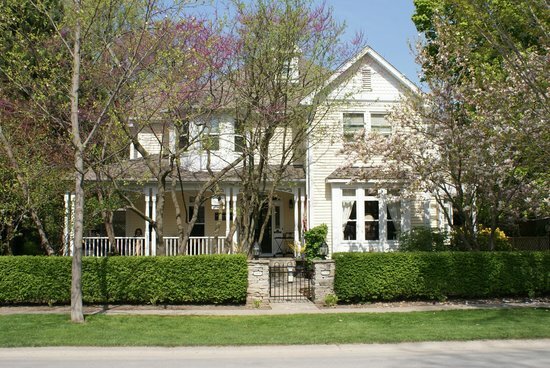 10 Niagara Falls Hotels Worth Booking Latest Niagara-on-the-Lake Bed and Breakfast Booking Deals Why Niagara-on-the-Lake is the Perfect Getaway Two Bees Bed and Breakfast – A Perfect Romantic Getaway!